Purchase a Nest thermostat at member exclusive pricing. Enroll in Rush Hour Rewards and receive a one-time $50 bill credit. Put a little extra money in your wallet, with a $25 bill credit for each subsequent year you participate in the program. *Nest and Nest products are registered trademarks of Nest Labs, Inc.
A home awarded with a BUILT TO SAVE™ certificate allows homeowners to relax without worrying about high energy bills, poor construction, and high maintenance issues. A BUILT TO SAVE™ certificate gives homeowners (1) the confidence in knowing their home was inspected and tested by an independent RESNET-approved Rater, and (2) the happiness in knowing their home is “above code” and of superior energy efficiency and high-performance construction. Don’t take anyone’s word that your new home has the BUILT TO SAVE™ features listed below. Ask to see the BUILT TO SAVE™ certificate! Construction Loan Programs Building Made Easy. NMLS #140044 Subject to credit approval. OUT WITH THE OLD. IN WITH THE REBATE. There’s nothing better than sitting down to share dinner with friends and family, and there’s nothing like cooking with natural gas. With a new natural gas range, you’ll get the control and consistency you need to make your favorite recipes, plus you can get up to $200 in rebates from Texas Gas Service. For more information, visit TexasGasService.com/RGVRebates or call 956-444-3910. INVEST IN VALUE YOU WON’T OUTGROW High-Performance and ENERGY STAR® certified new homes deliver marked energy savings year-round. With energy-efficient equipment and tight construction, each home is built to use 20% to 30% less energy than typical new homes. You get greater comfort, improved safety and indoor air quality, plus lower energy costs, while enjoying everyday moments beyond measure. Find a builder at SouthTXSaves.com. The Rio Grande Valley Builders Association Presents Its Annual Awards 2018 RGVBA BUILDER OF THE YEAR – DREAM HOMES by J&J Dream Homes, owned by brothers Jay and Jorge Gonzalez, was awarded “BUILDER OF THE YEAR” for 2018 by the Rio Grande Valley Builders Association. Dream Homes has been a long-time member of the RGVBA and is a loyal supporter of the organization’s fundraisers—especially the annual RGVBA Parade of Homes. The 2018 Builder of the Year award is presented every year to one of the RGVBA’s builder members in recognition of their outstanding service and contributions to the organization’s day-to-day operations. Dream Homes, with its consistent generosity to the RGVBA over the year, is truly worthy of this award. (L-R): Jay and Jorge Gonzalez, builders/ co-owners of Dream Homes––recipients of the 2018 Builder of the Year Award. 2018 LESTER MILES ASSOCIATE MEMBER OF THE YEAR – EPP MARKETING, LLC EPP Marketing (now Southpoint Systems, LLC), owned by Francisco (Paco) Vielma, was awarded the RGVBA’s “LESTER MILES ASSOCIATE MEMBER OF THE YEAR” award for 2018 by the Rio Grande Valley Builders Association. The award recognizes one Associate member or company who exemplifies the ideal Associate member like Lester Miles who–during his life–gave selflessly to the needs of the Association. Paco Vielma has volunteered many hours of his time to help the Association with computer hardware and software issues and maintains the organization’s website (RGVBA.org), providing support to keep all of the RGVBA operations moving smoothly. His technological and marketing skills play a major role in the success of the Association’s fundraisers. Paco continues to be an outstanding source of support for the RGVBA and is well deserving of this award—the highest recognition given to an Associate member by the RGVBA. Francisco (Paco) Vielma, Southpoint Systems, LLC (formerly EPP Marketing)–– recipient of the 2018 Lester Miles Associate Member of the Year Award. Sierra Title Company Brianna Rodriguez was the lucky winner of the Rio Grande Valley Builders Association’s (RGVBA) 2018 Parade of Homes TV Giveaway. The winning ticket was drawn during a meeting of the RGVBA at the McAllen Country Club. Mrs. Rodriguez registered to win at the home of Villanueva Construction during the Association’s 2018 Parade of Homes last year. Visit each Parade home to register. That’s 33 chances to win! Present to deliver the TV prize were (L-R): Marcy Alamia, RGVBA Exec. VP. ; Rosendo Benitez, Villanueva Construction; Brianna Rodriguez; Matt Wilson, Sierra Title; Gregory Vasquez, Villanueva Construction; and Marielsa Pulido, Sierra Title. L-R: Johnny Vasquez, New Homes Guide; Mario Peña & Eddie Garza, Infinity Homes; and Marcy Alamia, RGVBA Executive V.P. Every year at the Parade Kick-Off Meeting in the Fall, the Rio Grande Valley Builders Association (RGVBA) gives away a free entry into the Parade to one lucky builder. The winner of the free entry for 2019 was Infinity Homes (Mario Peña & Eddie Garza). An additional second prize included a 25% discount on the Parade entry fee which was won by Villanueva Homes. For more information on the RGVBA Parade of Homes, call Marcy Alamia at (956) 686-2932 or visit rgvba.org. Participation is only available for RGVBA members. LETTER FROM THE ASSOCIATION The Rio Grande Valley Builders Association is proud to present 33 homes from some of the area’s finest home builders participating in the 2019 RGVBA Parade of Homes who will open their homes for touring during the Parade hours. See the latest, most popular trends in the Rio Grande Valley home-building industry and meet the builders personally. The Rio Grande Valley Builders Association, Inc. (RGVBA, Inc.) is a non-profit 501(c)(6) corporation formed exclusively as a trade for charitable and educational purposes and operates for the benefit of home builders and those engaged in allied industries in the Rio Grande Valley area. The RGVBA is an affiliated member of the National Association of Home Builders, Washington, D.C., and the Texas Association of Builders, Austin, Texas. One of the top concerns of the RGVBA, Inc. is its image in the community because it knows the community turns to the home-building industry for shelter and lifestyle, which enables the builders to have businesses. Building the American Dream is our profession, our heritage, and our vision for the future. These two special weekends you can shop for your dream home by visiting the homes being showcased by the builder members of the RGVBA, Inc. at the 2019 Rio Grande Valley Builders Association Parade of Homes. The RGVBA, Inc. Parade of Homes is a great opportunity for builder members to showcase their talents and cost-effectively market and sell their homes. In preserving the American Dream as our greatest assurance of a rising quality of life in growing, vibrant, and caring communities, the RGVBA, Inc. is proud to welcome you to its 2019 Parade of Homes. Located in different subdivisions in the McAllen-EdinburgMission-Pharr-Alamo-Palmhurst area, these homes represent variety in size, style, décor, and price. The RGVBA Officers and Directors would like to thank the 2019 Parade of Homes Committee for the long hours of hard work and dedication spent in bringing you the 2019 RGVBA Parade of Homes. It is through their hard work and dedication that the annual Parade is successful. THE RIO GRANDE VALLEY BUILDERS ASSOCIATION, INC.
2019 RGVBA, Inc. Parade of Homes Officers & Directors (L-R): Back Row: Luis Adame, Texas Gas Service; Eddie Garza, Infinity Homes (Vice-President); Isaac Smith, Matt’s Building Materials; Joaquin Gonzalez, Classic Homes; Delfino Gaona, Keystone Construction. Front Row: Marielsa Pulido, Sierra Title Company; Marcy M. Alamia, RGVBA Executive V.P. ; Sandra Brown, Sorrento Fine Homes (President). Not Pictured: Abraham Quiroga, MVEC (Sec’y/Treas. ); Ronnie Cavazos, The Structure Team. 2019 RGVBA, Inc. Parade of Homes Committee Leaders, (L-R): Jose Vielma, New Homes Guide (Co-Chair); Mike Duffey, Builders FirstSource (Co-Chair); Marcy M. Alamia, RGVBA Exec. V.P. ; Manny Gonzalez, McCoy’s Building Supply; Paco Vielma, Southpoint Systems. Not pictured: Leslie Schey, 2-10 Home Buyers Warranty. Look for these official Parade of Homes feather flags & signs when driving around to find a Parade home entry. 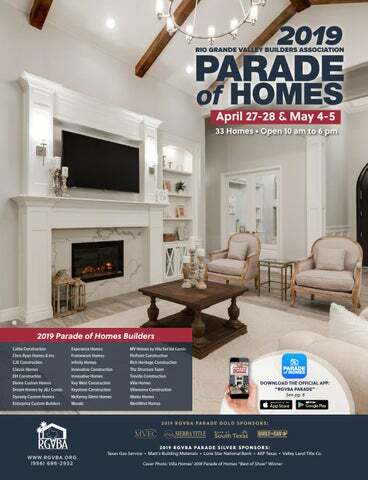 See all of the 2019 Parade of Homes entry locations below and plan your route. A LARGE FLAT SCREEN TV! Classic Lifestyles Are Born Here. The sports complex includes basketball courts, tennis courts, baseball fields, and much more. Two Beautiful Subdivisions, One Great Location. LO C AT E D I N E D I N B U R G , T X • O N E B LO C K N O RT H O F N O L A N A O N S U G A R R D.
Look for the official RGVBA Parade feather flag. Register at any Parade Home in West Oak Manor to win (2) $100 Home Depot Gift Cards courtesy of Domain Development. N 1 block North of Nolana on Sugar Rd. • Edinburg, Tx. In this competitive market, IT’S IMPORTANT TO HAVE A LENDER THAT CAN DELIVER. Congratulations to the 2019 RGVBA Parade of Homes Builders! O U R RO OTS A L SO R U N D E E P I N T E X A S.
Frost is proud to support the Rio Grande Valley Builders Association, Inc. And we’d be proud to help you along your financial journey too. Visit us in McAllen, Alamo, Harlingen and Brownsville or call (800) 51-FROST. Independent Builders and Weekend Warriors alike know McCoy’s has the products and the know-how to help make your next project a success... from start to finish. $4,000 ON CLOSING COSTS, PLUS NO ORIGINATION FEE* *Applies to Purchase Money Transactions and Rate/Term Refinance transactions only. 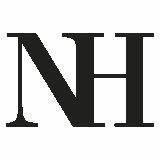 Financing available for properties in Texas and New Mexico. All loans subject to credit approval. Minimum loan amount may apply. This offer will have up to $4,000 in select closing costs (does not cover mortgage insurance, seller paid closing costs, discount points, or prepaids and reserves). This offer is not valid for FHA or VA loans. Closing costs may vary based on transaction. YOU BUILD IT, WEâ&#x20AC;&#x2122;LL BACK YOU UP. CALL US TODAY & GET PRE-QUALIFIED! Join The RGVBA It’s A Solid Business Investment When you join the RGVBA, you automatically become a member of the Texas Association of Builders (TAB) and the National Association of Home Builders (NAHB). Visit www.rgvba.org for RGVBA membership application. We can work directly with your builder and mortgage company to build your dream home. Contact one of our friendly loan officers to get started today!